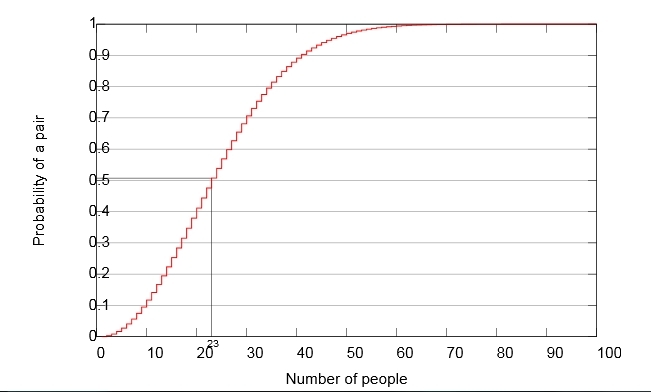 How many people need to be in a room such that there is a greater than 50% chance that 2 people share the same birthday. This is an interesting question as it shows that probabilities are often counter-intuitive. The answer is that you only need 23 people before you have a 50% chance that 2 of them share a birthday. So, why do you only need 23 people? The key to understanding this question is realising that when comparing if any of the (n) people in the room share a birthday, you are not simply making n comparisons – but C(n,2) (n choose 2) comparisons. If there are people A, B, C and D in a room I don’t just make 4 comparisons, I have to compare AB, AC, AD, BC, BD, CD. This is the same calculation as working out 4 choose 2 = 6 comparisons. Therefore when there are 23 people in the room you actually need to make C(23,2) comparisons = 253. This goes someway to explaining why the number is much lower than you would expect – but it still doesn’t tell us where the number 23 came from. If we simplify things so that we don’t have leap years then we can approximate the problem by working out the probability p(no shared birthday). When there are 2 people in the room the probability that person B does not share his birthday with person A is 364/365. When a third person enters the room the probability that C doesn’t share his birthday with A or B is 363/365. Carrying on in this manner, when the 23rd person enters the room, the probability that he doesn’t share a birthday with anyone already there is 343/365. So p(shared birthday) = 1 – 0.49 = 0.51 (2 dp). Therefore when there are 23 people in the room the probability of a shared birthday is around 51%. Which we can solve using the quadratic formula to give n = 23 almost exactly. You can also extend the problem by looking at the probabilities at least 3 people have the same birthday. Wolfram Alpha have an online generator to allow you to do this. The Gorilla in the Room and other Great Maths Investigations – some great ideas for statistics investigations and good links to maths ToK – can we believe our senses? How Are Prime Numbers Distributed? Twin Primes Conjecture. Discussion on studying prime numbers – in particular the conjecture that there are infinitely many twin primes. 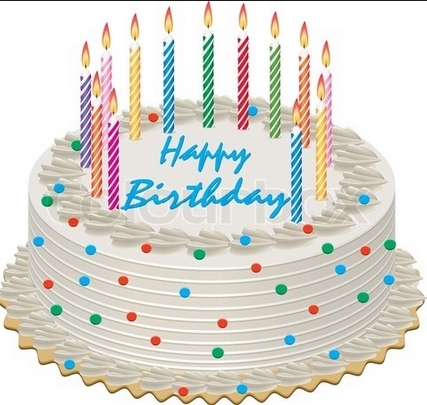 Hi, I believe that the link to Wolfram Alpha is incorrect because there isn’t an option where you can calculate the number of people needed for the chance of a 3 people shared birthday. Instead, on Wolfram Alpha, you have to input the number of people. You input the number of people in a room and then scroll down to see the probability that either at least 2 people or at least 3 people share the same date.